The no word verification thing on comments was good for about a week or two. I don't get huge amounts of spam, but enough to annoy me after two weeks. Spam is bad enough, but having it archived on a hard disk somewhere in my comments section goes against my basic don't waste principles. And I don't feel like monitoring comments or cleaning out ridiculous stuff. Wow, indeed nice article. How can I get this RSS? So today I went out to this willow patch and got some willow shoots to plant behind the shop. Chopped them up into foot long sections and stuck them in a bucket of water. In a week or so they should be sprouting roots. I know this works because one time when I had harvested more rib stock than I could use right away, I put the excess in a bucket of water to keep them pliable and after a week or so they sprouted roots. Once they have roots I will plant them. I know they will survive into spring. Who knows what happens after that. I can water them for a while till their roots get thoroughly established. After that, they will be on their own. They will either send roots down till they find water or they will dry up. I hope they make it. I also stopped by the quince trees. I don't know why they are where they are. They are not native. Someone may have planted them long ago before this was park land. The quince were all gone. I got there a little late. The deer ate them all. There's deer tracks all around the trees. Maybe the deer munched the quince when they were younger and got them to send up all those skinny straight shoots. They bend nicely. Would make some good boat ribs. A while back I picked up this book called Fabulous Folbot Holidays at the local used book store. I got it mostly for the pictures, I thought. I loved the vintage 70's era photos. I took the boat home and stuck it in the bookshelf and didn't look at it for a year. A week ago I pulled it out again for whatever reason and started reading it. Really quite entertaining. It's part stories and testimonials by people who owned Folbots and part advertising copy for different Folbot models like this one following. Hey, it's the 17-1/2 foot Super. Looks a lot like my first baidarkalounger which comes in at 18 feet and is 32 inches wide. 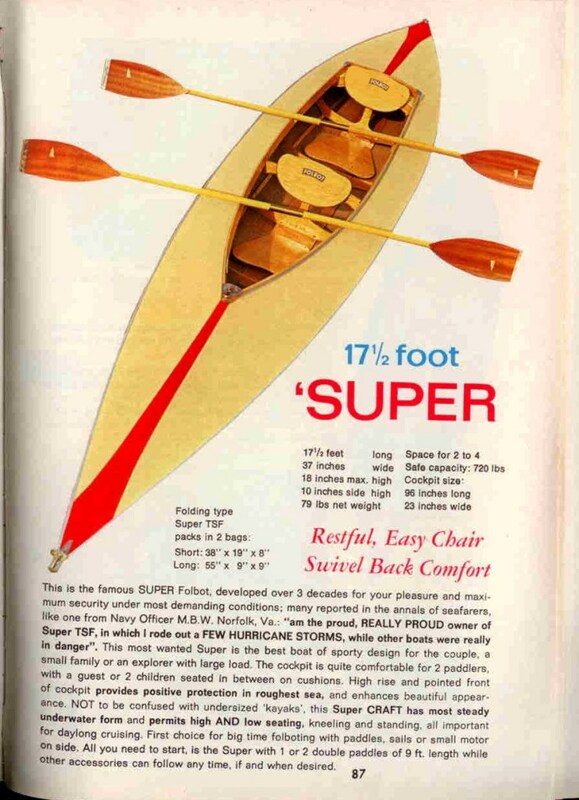 Only the Super is 37 inches wide. If you click on the photo, you'll get a large view and can probably read the specs and the advertising copy. So what I discovered was that a boat that big is too much for one person to paddle casually, though I've done it. It's not impossible. It's just not desirable, It's just more work than I typically want to do. So then I built another baidarka, this one a little shorter, 15 feet and 30 inches wide. 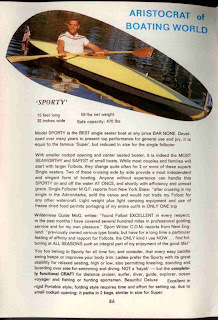 And wouldn't you know it, Folbot had a 15 foot boat as well. They called it the Sporty and made it 32 inches wide. You might almost say that I was channeling Folbots for a while there. I don't really know how these things happen. I wasn't thinking of Folbots when I made my baidarkas. They just turned out proportioned like slightly slenderized Folbots. 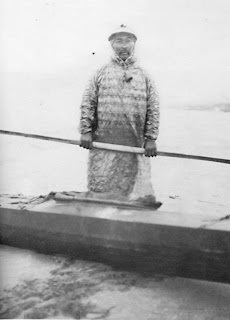 I was really taking my inspiration more from sailing canoes of a hundred years ago, at least on a conscious level. And then I started thinking that yes, back in the 60's my dad had a Folbot and I used to paddle that but it didn't make any kind of impression on me that I could tell at the time. Never had a desire to own a Folbot, but here I am building baidarkas that are shaped an awful lot like Folbots. 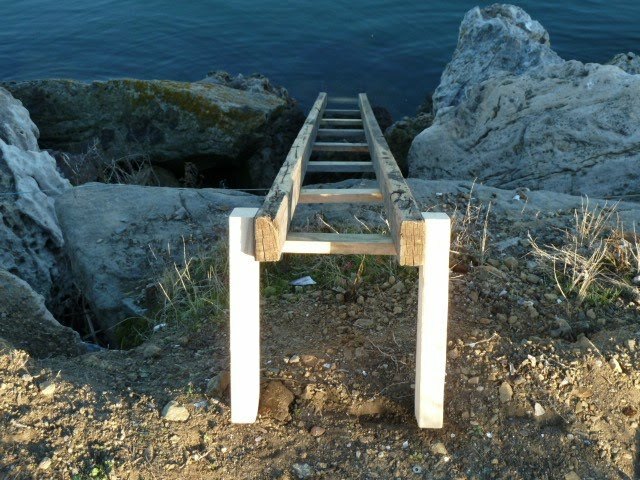 The workings of the boat building mind are truly mysterious. 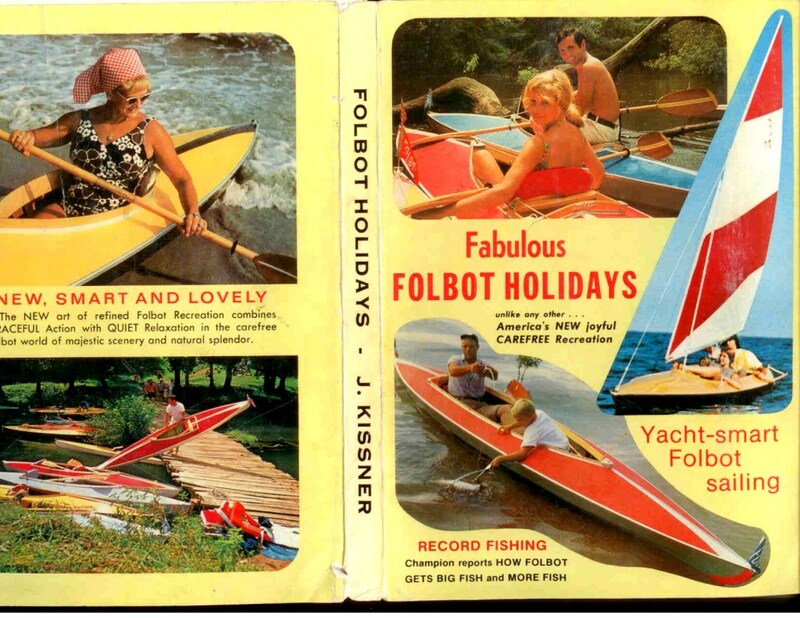 And the weirdest thing about these Folbots is that they really are not bad boats. They are a little wide by today's standards, but they are stable and probably paddle a heck of a lot better than plastic sit on tops. Who knows, I might be tempted to build a real Folbot, one that fols up into a bag. I picked up a copy of Eric Sloane's America at our local used bookstore the other day. What becomes apparent if you read even a little of the book is the prodigious amount of wood consumed by the early European settlers. There were so many trees to cut that they didn't have to bother with twigs. As Kilii points out in a comment, native dwellers did coppice, most likely because given the tools they had, it was easier to collect twigs than to cut down whole trees and split them. 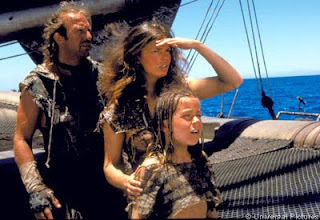 And Kiliii and his crew are keeping up the tradition. 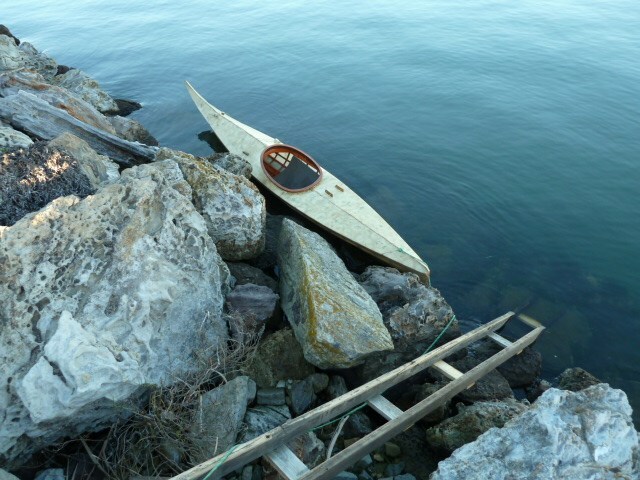 So I am happy to hear that somebody beside myself collects twigs for boat building. 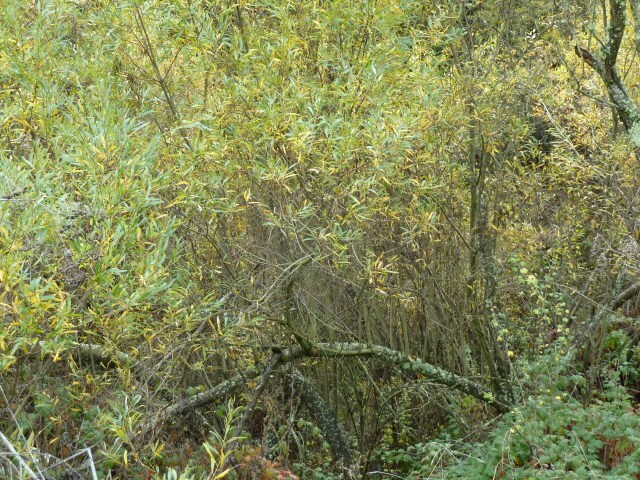 And finally, here is a picture of pollarded willows. The picture is from the back cover of a book I had read as a kid. 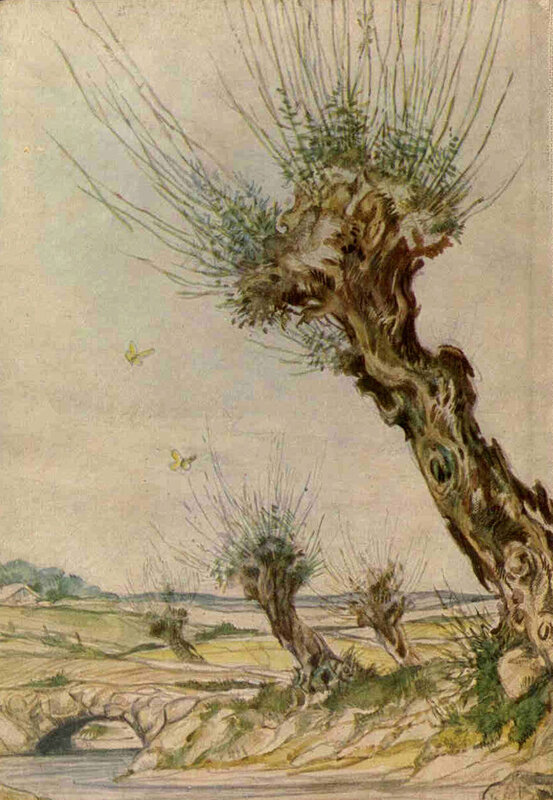 It shows a medieval German landscape. Willows grow here and there next to the road. But they are entirely lacking in branches. Every winter, the thin shoots are cut for basketry and brooms and whatnot and every spring, the willows put out new shoots with enough leaves to nourish the tree and keep it alive for another year. 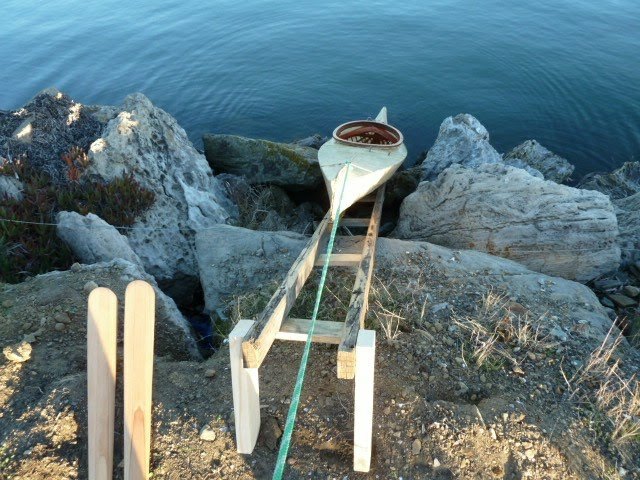 Dave Wilhelm asked me if I had any thoughts on how to build an ulux^tax^, an Unangan (Aleut) two-holer in which the bow paddler stays dry. I gave him a brief reply and told him I would post some pictures here for the benefit of a slightly larger audience. So here goes, a picture. The really apparent thing here is that the front 3 feet of this boat are sticking out of the water. This seems to be an extreme case. Most of the time only the front 2 feet of a double would stick out of the water, but you get the idea. 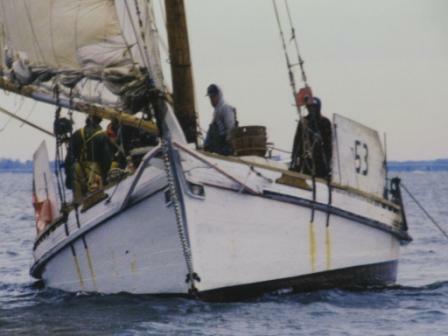 What makes for a wet ride in a double is that the bow spears a wave and the water on deck douses the bow paddler. 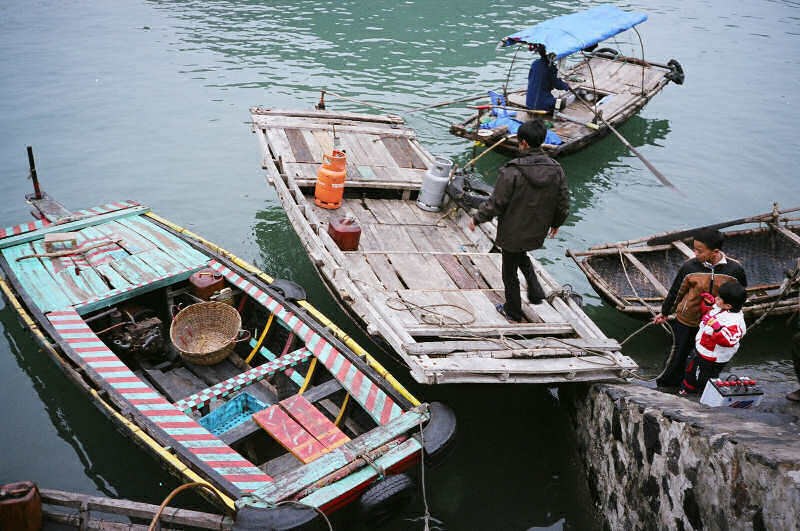 The trick is to prevent the bow from spearing into the face of a wave. Elevating the bow is one way. Making the boat flexible is another. A long stiff boat with some momentum to it has no option except to spear into a wave unless it has a good deal of rocker and enough volume forward to lift the bow. Having flex lets an ulux^tax^ pick up rocker as needed. Although much has been written about the flexibility of baidarkas, little has been said about the role of the skin. My observation is that regardless of how flexible the frame is, a tight skin with little stretch to it will limit flex of the boat as a whole considerably. I have no experience with hide-covered boats, but I suspect their ability to stretch would have affected how flexible they were. You don't hear much about coppicing and pollarding in America. And right now, as I'm typing this, the editor is putting red squiggly lines under both of the words because they aren't in the editor's dictionary. So, in case you haven't figured out what coppicing and pollarding are, let me tell you. Coppicing is the practice of sawing off a young tree at ground level. All the roots of the tree are intact so next year, it puts out several shoots from the stump you have left behind, and in a few years, how many, depends on how big a piece of wood you need, you have several straight pieces of wood suitable for things like fence posts, hurdles and other application. Pollarding is similar to coppicing, except you prune all the branches off an older tree and just leave stumps. Next year, the stumps put out new branches, each one a straight shoot especially suited for things like basked weaving. I really don't know why coppicing and pollarding isn't practiced much in America, but I know that it is in England. The reason it is practiced there, I am theorizing, it twofold. 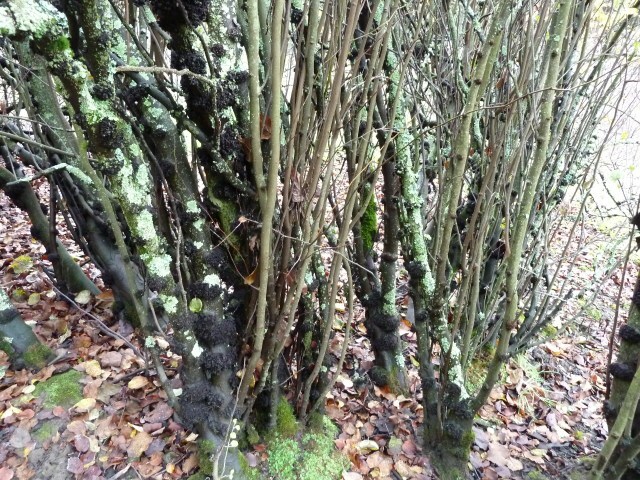 One is that coppicing and pollarding works best with certain species of trees which seem to like the British climate. The second reason is that Britain has been densely populated for a long time and so mature logs are not as plentiful as in North America. As a consequence, the British have come up with a way to quickly raise useful wood in less than full tree dimensions. And as I already alluded, coppicing trees looks like a good way to grow boat parts like ribs or stringers, and for small boats, even gunwales. 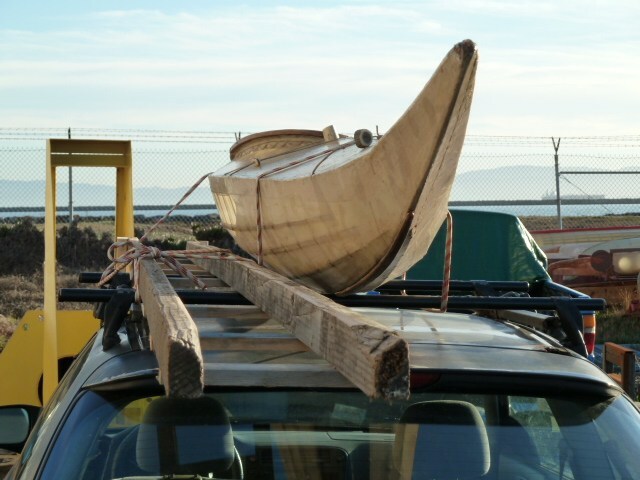 What appeals to me is the idea of growing boat parts to the proper dimensions so all you have to do is peel and trim which is a very low tech way of processing wood. No running full grown trees through a saw to produce lots of sawdust and a few usable planks. Anyway, I'm looking to do some coppicing provided that I can find some suitable wood species that will grow locally. 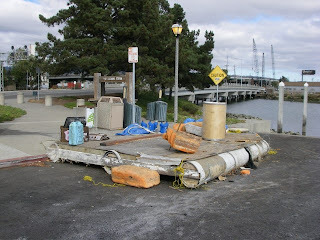 The west end of Alameda, a former salt marsh topped off with dredged fill, mostly sand. Will anything tree-like grow here? It's raining now & I can probably get some willow shoots going. But no rain from March to November. Who knows what will survive. a few posts back I put up a little youtube video clip of a Russian Aleut accordion player. So most recently, I got a friend invite on youtube from sunfish737, another Russian accordion player, not Aleut though. Check him out. he has a bunch of videos of himself playing accordion. sort of a punk sensibility. The accordion seems to be to Russians what the guitar is to Americans, a medium of proletarian expression. But OK, so what does this have to do with boat building? Check out the background in this video. It is what the British call a hurdle, I think, a fence made of small diameter sticks woven around verticals stuck into the ground. 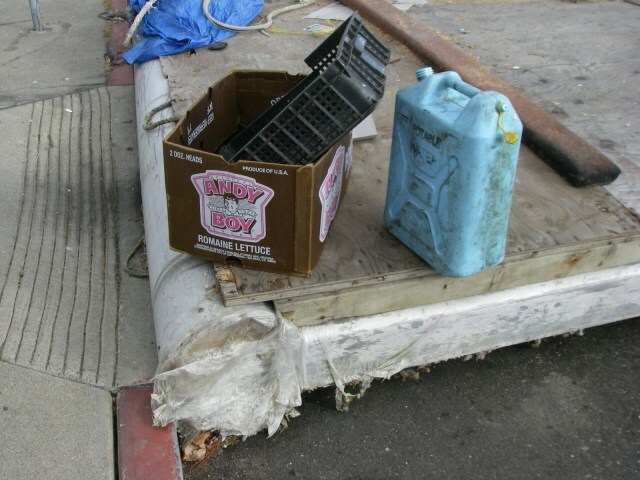 Anyplace that can grow these can come up with wood for a skin on frame boat. Anyway, enjoy the accordion playing. everything is connected - a corny concept, perhaps somewhat discredited by blatant overuse by the new age crowd. Nevertheless, if you have an active mind, you can connect everything and anything with anything else. 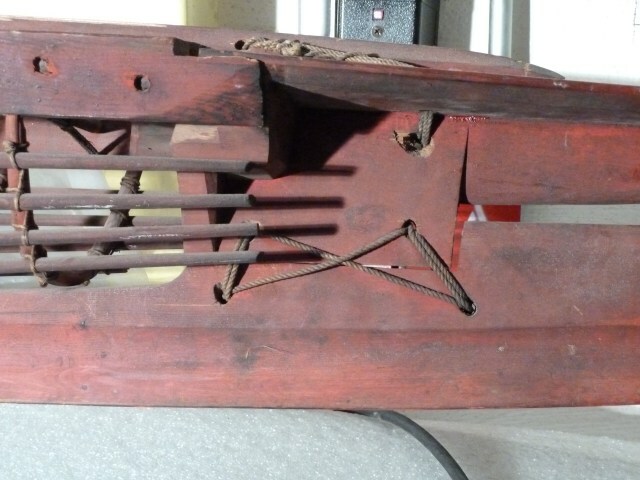 So in short order, I have managed to connect the Russian Aleut accordion player with another Russian accordion player with coppicing with boat building with new age thought. Anyway, the idea of connectedness was not invented by new age thinkers, it was simply revived by them. The central concept is animism, I think, that everything has spirit which is the substrate that connects all things. So there we go. Animism is still the major explanatory concept throughout most of the world, much more popular than materialism which is what drives industrial cultures. I don't know if this is a valid connection, but it seems that where materialism is the intellectual substrate of industrialism, animism is the intellectual/spiritual substrate of pre and possibly post industrial societies. So here is my proposal for the day: animism is the driving force of post-apocalyptic boat building. 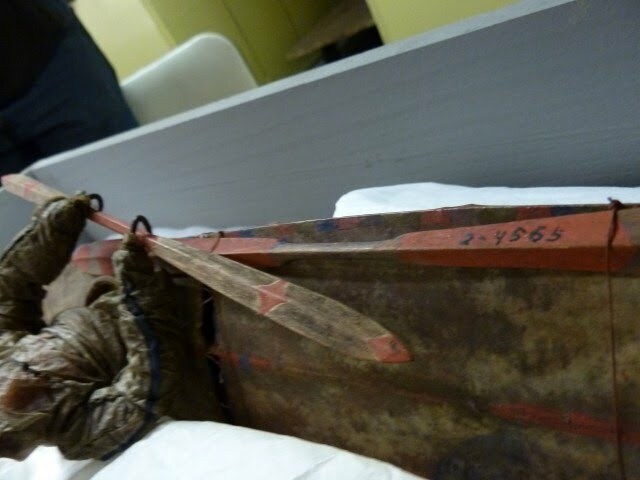 This year, Andrew Abyo built an Alutiiq kayak with us. He decided to take the urban kayak approach and go with the plastic ribs. That's Wayne's hand in the picture. Wayne was helping out with both kayaks, the urban Aleut and the urban Alutiiq. Here's Andrew demonstrating rib shape. 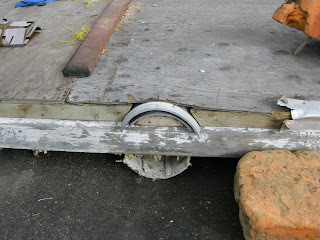 A short piece of aluminum rod gives the flat center profile while the bilges stay round. 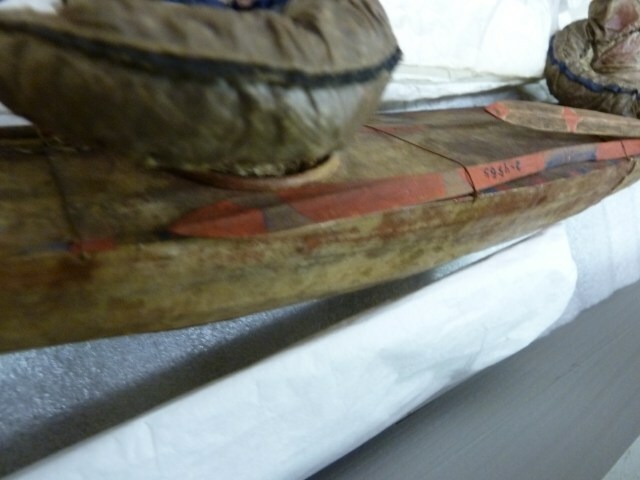 Andrew used some cable ties to hold the hull stringers to the ribs but also did some lashing with artificial sinew. Here's a picture of the bow which we cut from plywood. The paper template is laying on the ground. The cockpit rim was plastic as well. Here Andrew is pretend bending it with his teeth the way that people used to do with wood in the days when they lacked materials to make steam boxes. The hull is stained the traditional red and Andrew is just putting on some finishing touches. Last day. We almost finished the sewing except around the cockpit. And a side view to show off the nose. Looks like the head of an eagle, doesn't it? And one final shot of Andrew in the dining hall of the APIA building. This year at culture camp, we built an urban kayak. 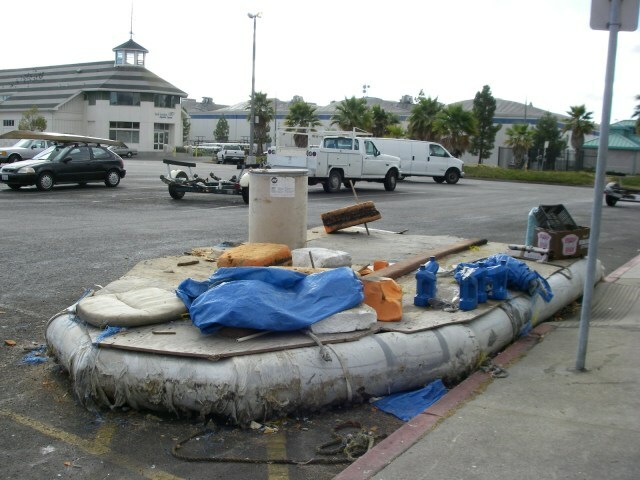 The idea for this boat was hatched by Mike Livingston. 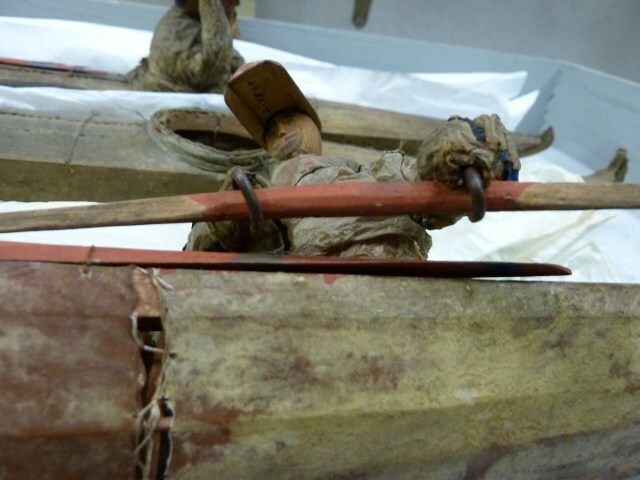 The premise was that a modern Aleut living in an apartment in Anchorage would not have access to a whole bunch of wood working tools but might still want to build a baidarka, an iqyax^. The challenge was to come up with a list of materials that we could pick up at a home supply store like Loew's or Home Depot and without the use of a table saw be able to turn those materials into a usable iqyax^. The other idea was that in spite of the use of non-customary materials, the resulting boat would still be recognizable as an iqyax^. 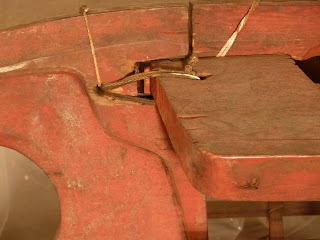 The biggest challenge for making the boat was to find a substitute for steam bending the oak ribs. We settled on flexible plastic water pipe. The pipe bent nicely but not in the shape we wanted. To get the flat mid section, we inserted length of quarter inch aluminum rod in the middle. 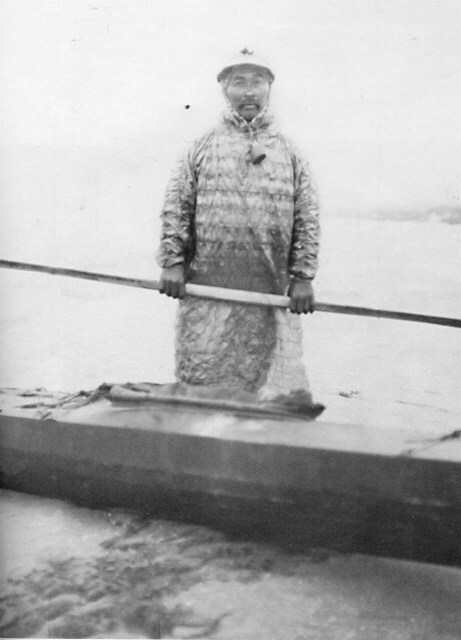 Gunwales were twelve foot red cedar one by twos. 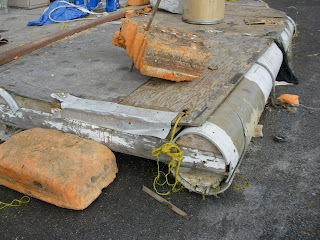 The stringers, as you can see were aluminum rod, and the stringers were attached to the ribs with cable ties. How plastic can you get. I was skeptical about the chances of getting a decent hull shape, but as it turned out. I needn't have worried. The shape turned out fine. And as you can see above, once the skin was on, the boat looked just dandy, hard to tell that there was all that plastic inside. Never mind that the skin was made out of plastic fiber as well. And here we are, sewing on the skin around the square cockpit. This was not meant to be an ocean boat but more something that anyone could step into and paddle without the hassle of squeezing into a small cockpit. In case you're wondering, one of the kids appropriated some cutoff boat skin and turned it into a mask. And everyone who worked on the boat signed the skin. 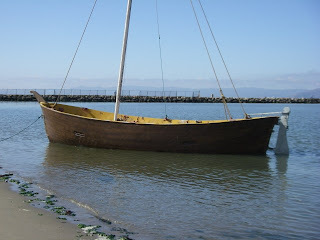 And here's the boat with the faux sea lion hide finish. Ready to launch. 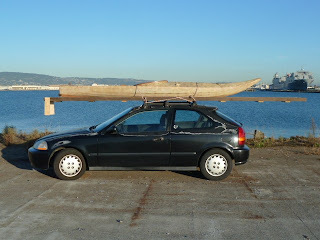 Lately, I have been building wider kayaks, both for reasons of comfort and for potential use in sailing. 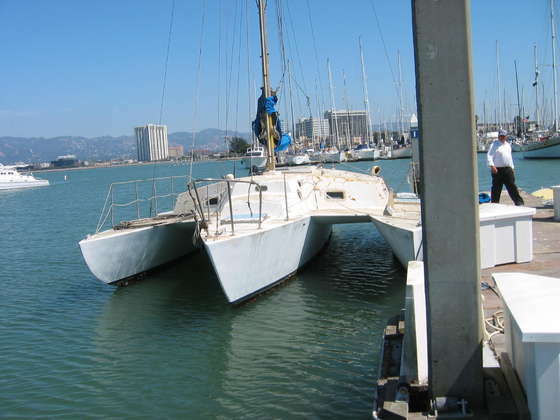 If you want to hang a sail off a boat, you want some stability and stability is achieved by making the boat wider. 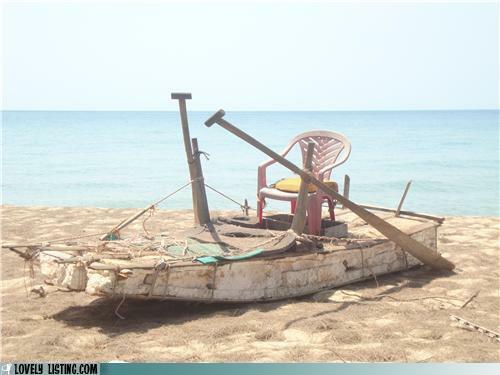 A wider boat is unfortunately a slower boat to paddle. So the question is, where is the point of compromise? Just how much speed do I want to trade off for stability. I ponder this question each time I haul a kayak down to the water. Last night I paddled one of my skinny baidarkas. I was of course pleased by its speed but also considered that it was not a good beer drinking platform. But when I paddle one of my wide boats, I am pleased by the fact that I can lay back in it and if I wanted to, drink a beer. 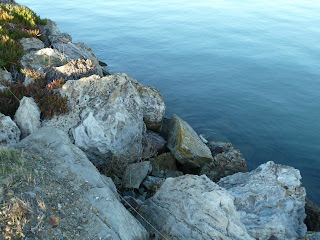 But then, running my usual circuit once around Alameda's Coast Guard Island, I find that I don't like the drop in speed. Of course, speed is relative and perceptions can quickly change. If my speed drops from 4 mph to 3 mph, how big a deal is that? What if I just relax, paddle no harder than usual and just take a little extra time to run my circuit? And here's another revelation. I like how my body feels after I paddle. I always knew that I felt better after I went out in my kayak, but I assumed that that was just something that came from being in a kayak. It is in part, but the largest part of the feelgood response is caused by the effort of paddling. On summer afternoons, the wind blows from the west on SF bay, and the estuary where I paddle runs east-west and the wind blows straight down it. I have found that with a sail on my wide kayak, I can sail two miles up the estuary, even with the tide going out and then paddle back home. Great stuff for relaxing, but I have found that I miss the feelgood response that paddling produces. Oh well. The search for the perfect compromise goes on: a kayak that is fast enough for paddling but doesn't have to be wide enough for sailing. 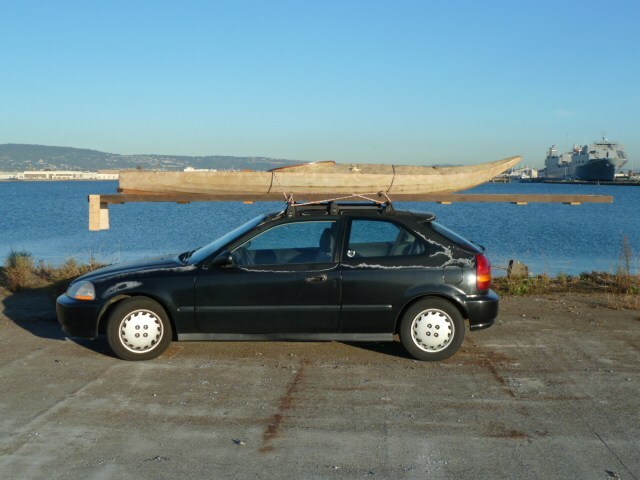 I'm starting to be of the opinion that with world population pushing on toward 7 billion people, wood is no longer a renewable resource, at least not the kind of wood that used to be used for boats and paddles. It's turning into a material used primarily in the manufacture of luxury items. Yesterday, my shop partner Sebastian was working on some shelving he had bought at Ikea and was modifying. 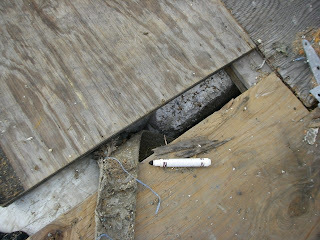 He sawed through the shelf which was about 2 inches thick. The flat surfaces were made of 1/8 inch of some composite. The sides were faced in plastic. The perimeter was made of chip board and the hollow interior was filled with a paper honeycomb material. I suspect that in the northern latitudes of the world where trees are small, they do not bother cutting trees into boards. I suspect that they feed it directly into a chipper and then glue the chips into particle board. Wood is the feedstock for an industrial process. Of course you can't build boats out of the kind of stuff that Ikea makes furniture out of. You need actual wood for that. Same sort of dispiriting trends that have developed for boat building wood have also developed for paddle building wood. My supplier has piles of Sitka spruce in his warehouse, but he hasn't re-ordered in a while due to the recession and each time I go to get more wood for paddles, I have to pick through more boards to find the few good ones suitable for paddles. So yes, wood is renewable if you're talking of the stuff you can plant now and harvest in ten years, but boat building wood has always been cut from trees that have had a hundred years of growth or more. Once we cut all of that down, it will be the twenty second century until we can see some more of it, assuming of course that anyone lets a tree stand that long. Every year, the magazine Scientific American puts out a special issue devoted to a single topic. This year's issue is entitled the end. Or is it? Popular science magazines aren't noted for their deep thinking. Their editorial content trends firmly toward cheerleading science and technology. So the current issue of Scientific American is a pleasant surprise. Among other things it has a list of technologies that in the opinion of the editors the world would be better off without. What a concept - technology is not all an unalloyed good! Scientific American is not the first body to have this idea, but for a cheerleading magazine, it is a good start. It also has an article on resources that the earth does not have limitless supplies of. Among them, oil, silver, gold, copper, coal, all due to run out in this century. So what does any of this have to do with building skin boats? Nothing, directly, but wood wasn't one of the things we're expected to run out of this century. So skin boat building has some promise for the future. 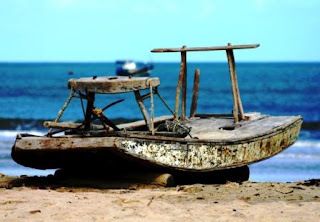 Skinboat building has its problems as well, like what to use for a skin in place of nylon or polyester when the oil is gone later in this century. Or if you're living in a place that has no wood like Easter Island where you've cut down all your trees, what do you make the frame out of? Problems, problems. 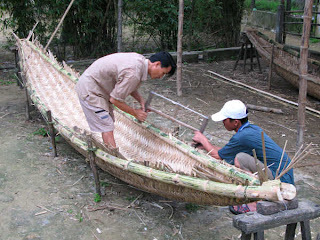 But perhaps the part of skinboat building I like the best, apart from the difficulty of finding a suitable skin is the low tech nature of the process. It isn't reliant on any upstream industries for its raw materials. You can get your own wood, whittle your own dowels and spin your own yarn. OK, I'm starting to sound like a survivalist. I'm not a survivalist. 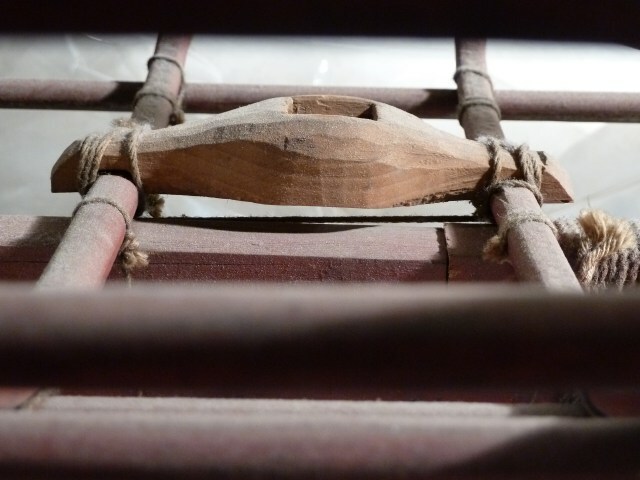 But I do like whittling my own dowels and thinking about how I would drill holes without electricity and I do own a rip saw, the kind you operate with muscle power. etc. etc. Well, enough congratulating myself on what a clever fellow I am. Go out and buy a copy of the current Scientific American and read all about the possible ways that the world will end. What the heck disaster sells magazines.